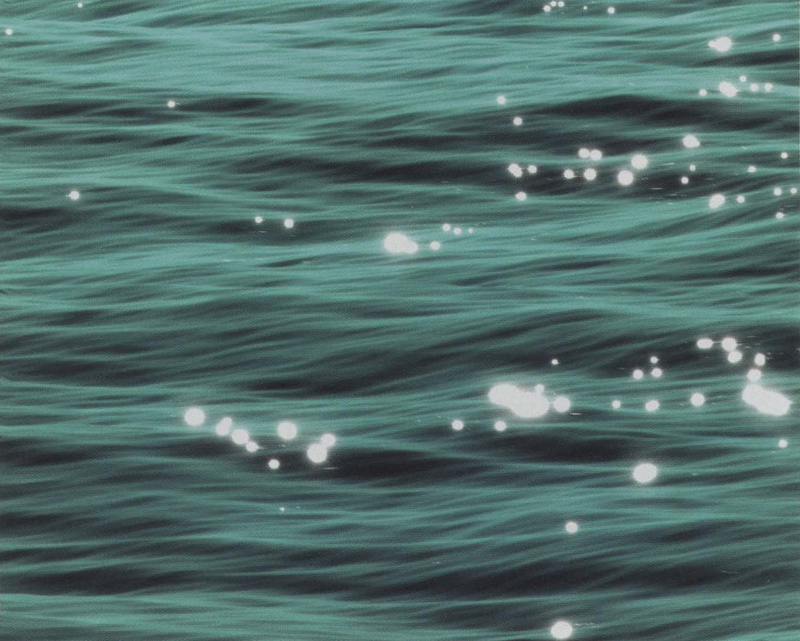 These works are based on a visual investigation of the sensation of light and reflection on water, consisting of short, computer-animated sequences. These have been designed to be shown on plasma screens as slowly moving artworks. The primary intent is in realising the sensations evoked by the play of light on water. The colours and shapes generated by the movement of waves and ripples, the changing surface of reflections, the light bouncing off the water surface. The sensation of light on water generated by specific rivers and seas at different times of the year. The work explores the area between realism, exploring the tools now available in a 30 computer-animation system for these purposes, and abstraction, looking at the aspects of colour, form, and movement. The view is presented straight on to produce a flat perspective in line with the picture surface. The work is influenced by a number of artists, primarily Monet and Bridget Riley. sparkles were produced using the Glimmer output shader for XSI developed by Andy Hayes at Bournemouth University. • The scene consists of a grid for the water surface and a small semi-sphere for a final gathering reflector. displacements applied to it to simulate waves and wavelets. • The grid (water surface) is lit by an infinite light source and final gathering was applied using a small semi-sphere as the source. • A specular pass, with the Glimmer’output shader applied, was added to the final image using the Softimage:XSI compositor to simulate the reflection of the specular light emitting from the wavelets. The image was output on an inkjet printer using archival pigment inks on etching paper. The work was produced on a Dell PC.